The cast hollow-point (HP) bullet is arguably one of the best hunting bullets available for deer-sized game. Many folks associate the use of cast HP's with sixguns because of the popular writings of Elmer Keith and Skeeter Skelton, but cast HP's can also be used to good effect in rifles. In fact, the original cast HP designs were for the .44-40, .38-40 and .32-20 lever-action rifles, and were reported in the early Ideal Handbooks to "increase the killing effect of these rifles by 50%". Not surprisingly, the added velocity of the rifle increases the vigor with which these cast slugs expand. While obviously not appropriate for large and dangerous game, the cast HP can be very well suited for heart/lung shots on deer-sized critters. The .30-30 Winchester cartridge was introduced in 1895 in the Winchester Model 1894 lever action rifle, and the cartridge design is very well-suited for cast bullet shooting. It has a moderate case capacity, meaning that moderate powder charges are easily ignited, and less prone to position sensitivity. It has a long neck, so that grease grooves are covered and not exposed to collect dirt. The bullet weights that work well in the .30-30 do not require being seated with the base of the bullet below the bottom of the neck. And the cartridge performs beautifully in the 1500-2000 fps range, a velocity range where cast bullets have a well-established track record of excellent performance. Over the past several years, I've accumulated a fair amount of experience loading cast bullets and cast HP's in the .30-30 cartridge, but most of that experience (until recently) had been focused on loading for the Thompson-Center Contender. For this handgun, I have grown fond of the Guy Loverin designed 311466 HP (157 grains) loaded over 32.0 grains of H4895 for 1790 fps from a 10" Contender. Accuracy is good, and it hits like a ton of bricks. However, this bullet is not suitable for the tubular magazine of leverguns due to the pointed profile of the bullet. A different cast bullet would be needed to extract this level of performance from America's favorite deer rifle. The Lyman 31141 was introduced in the early 1960s, and was designed specifically for the .30-30 cartridge. At first glance, the 31141 appears to have a very early cherry number (#41), which would suggest that it is much older than this, however this is an example of a recycled cherry number. The 31141 did not appear as a part of the Lyman catalog until Lyman Reloading Handbook 43rd Edition (published in 1964), where it was listed as "the new flat nose bullet for lever action rifles. Excellent performance." Just for the record, the original cherry #41 was the Ideal 30841, a smooth, flat-pointed, paper-patched bullet. It was cast in an adjustable mould that allowed the caster to vary the bullet weight by adjusting a threaded base plug. The 31141 (later re-numbered the 311041 when Lyman standardized their mould numbering to 6 digits) was clearly designed with the .30-30 in mind. The .30-30 Winchester is one of America's most popular hunting rounds, it’s best served with FP bullets, operates best with bullets weighing around 170 grains (the nominal weight of the 31141), and the 31141’s crimp groove is properly placed to achieve an overall cartridge length that functions smoothly through a levergun (2.53"). The 31141 immediately became a popular cast bullet for the .30-30 levergun. In the past, Lyman offered the service that any non-hollow-based mould design they offered could be special ordered in HP form (sadly, this customer service is no longer available). As a result, one can find all sorts of Lyman/Ideal HP moulds for a wide variety of mould designs IF one shops around long enough. I have long felt that a 31141 HP would make a very interesting hunting load in the time-honored .30-30. At some point in the last 40 years, someone else felt the same way and placed a custom order with Lyman for a 31141 HP mould. Eventually, this mould made its way into my hands. The Lyman 31141 hollow point. The test rifle for this project was one of my personal favorites -- 1948 vintage Marlin Model 36 (this rifle pre-dates the Model 336 and Micro-Groove rifling, it has 6-groove "cut" rifling that is as sharp and shiny as the day it left the factory). The bullets were cast to a BHN of about 13 (similar to WW alloy -- I used 2 parts recovered range scrap and 1 part linotype), checked with Hornady crimp-on gas checks, sized .311" and lubed with my homemade moly lube (equal parts by weight beeswax and moly grease). They weighed 169 grains after being checked and lubed. Resized cases were flared gently using my home-made universal flaring die (I made mine from a surplus 9mm flaring die, this is very similar to one that Jim Taylor has been using for years). Initial test loads were assembled using 24.5 grains of IMR 3031 and Winchester Large Rifle primers. 5-shot groups at 50 yards ran 1 1/2", which is about all I can reliably coax out of buckhorn sights, and velocities hovered right around 1750 fps. The Marlin 36 .30-30 levergun. About this time, I asked around to a couple of my friends, each of whom has a lot of experience loading cast bullets in the .30-30, as to their favorite powders/charges. Charles Graff likes 20-22 grains of 4198 for his cast bullet .30-30 shooting (a recommendation echoed by none other than Ken Waters), and Jim Taylor is fond of 26.0 grains of H335 (in my gun, this fine load generates 1967 fps and excellent accuracy). Rob Applegate is a big fan of the Remington pump action and semi-auto rifles, and knows more about the Remington line of cartridges than anybody I know. When queried on loading cast bullets in the .30 Remington, he responded that the only powder he used in the .30 Remington was IMR 3031, he just tailors the load for the bullet at hand. These gentlemen’s loads tend to generate velocities in the 1600-2000 fps range, and provide good accuracy. Overall, a fine recipe for venison. The bottom line is that 1600-2000 fps is a very comfortable velocity range for the .30-30 and cast bullets, and one that tends to give very good accuracy. If a hunter were shooting jacketed soft point ammo at these speeds, expansion might be an iffy thing (especially at the lower velocities). However, the softer and more malleable cast HPs expand much more readily than do their jacketed counterparts. In order to get a feel for just how much more vigorously, I conducted my standard expansion test: a 2L plastic bottle, filled with water and laid on its side and penetrated lengthwise. In this case, using Jim Taylor's load of 26.0 grains of H335, it was not necessary to capture the bullet to tell if it had expanded, the spectacular way in which the bottle burst clearly indicated violent expansion, and the gaping hole in the far side of the plastic bottle revealed that it punched right through the far side. This was an interesting test -- usually when I do something like this with a revolver, I get sprayed with water and the bottle gets swept 15-20 feet off of the stump. This time, the bottle was completely misted, and the water simply turned into a sphere of fog. The bottle was found, severely ruptured, lying a couple of feet behind the stump. Basically, everything happened so fast that the bottle didn't get a chance to go anywhere. I was carrying this rifle and load during Washington deer season, but never found any legal bucks. I joined Rob Applegate to hunt coastal blacktail in southern Oregon and while we saw deer, once again there were no shootable bucks (although there were a memorable couple of frisky yearlings that decided to play tag about 6 yards in front of me!). Jim Taylor's luck ran a little better than mine; he used one of these bullets in his trusted Winchester .30-30 to shoot a Missouri whitetail. He took the shot from about 150 yards. At the shot, the doe jumped and ran into the woods. After poking around a bit, they found her where she had dropped, back in the trees. The bullet had entered in the front of the right shoulder, ranged through the heart and lungs, and exited out the left side of the animal. The exit wound was a bit larger than a dime. When Jim was skinning her out, he found the entire chest was bloodshot. The entrance wound through the front of the breastbone was about 1" in diameter. Clearly, the cast hollow-point expanded pretty violently, and did a good job of stopping the deer, as she didn't run far. Given the amount of damage incurred, Jim said he's glad he wasn't closer! It’s clear from Jim's description that this was significantly greater expansion than one normally gets from jacketed bullets in the .30-30, especially at this range. This is typical for what one generally observes with cast HP's. Rapid, violent expansion early after impact, followed by a longer narrow wound channel and a small exit. If this sort of wound channel sounds familiar to the reader, perhaps it should, because qualitatively this is similar to the wound channels created by the highly respected Nosler Partition. For cast HP's designed for rifles (i.e. those cast HP's with reasonably high sectional density, like the 31141 HP), the wound channels in deer-sized game created by velocities in the 1500-2000 fps range bear a number of similarities to those created by Partitions at 3000 fps. There's a good reason for this similarity, their expansion behavior is similar. Rapid, early expansion results in a large amount of soft tissue damage early on, then the expanded petals break away, leaving the back half of the bullet (basically a wadcutter) to punch out the back side, leaving a small exit wound, or stopping under the hide on the far side. Now clearly a cast HP is not going to turn .30-30 into a .300 Magnum, shooting 180 grain Partitions, nor will it penetrate as deeply (penetration depth is generally not an issue for deer, as most shots exit), but as far as the amount of tissue damage inflicted upon a 150-200 pound deer, there will be some notable similarities. Most importantly, the deer will be dispatched quickly and humanely with a cast HP. And the cast HP offers the satisfaction of taking game humanely with an expanding bullet that you made with your own two hands. If the hunter wishes to limit the amount of blood-shot tissue, then all that's needed is to back off on the velocity to moderate expansion of the cast HP. For example, I shot one large mulie doe a year ago with a similarly constructed cast HP (a HP version of the Ideal 33889 that I made up for a T/C wildcat) at around 1300 fps. She was angled away from me fairly sharply at about 50-60 yards. The bullet entered just behind the last rib on the right side, just nicked the stomach, punched through the rear portion of the right lung, the top of the heart, and the front part of the left lung, then exited on the point of the left shoulder (total penetration was about 30"). Like Jim’s deer, the exit on this mulie was about the size of a dime. She trotted less than 50 yards and collapsed. The wound channel suggested that the bullet had expanded in a controlled fashion, and there was very little bloodshot meat on this animal (there was a little bit in the shoulder, due to a rib being hit). Velocities between 1300 and 2000 fps would, logically, lead to intermediate degrees of expansion for these cast HP's, and presumably, intermediate levels of bloodshot tissue. I suspect that the 31141 HP at around 1600 fps would pretty much duplicate factory ammo expansion (and wound channels), from a mild load that would be easy on old guns. The 31141 HP is a fine hunting bullet for deer-sized game in the .30-30 (as well as other .30 caliber rifles). 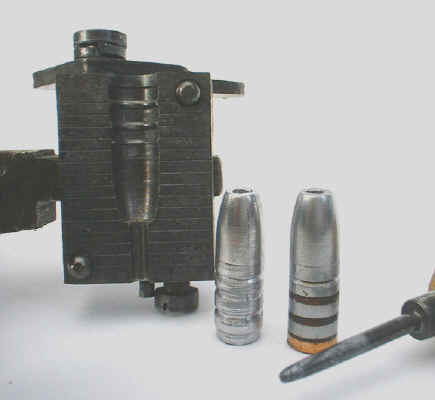 It offers more violent expansion than is possible from typical jacketed ammo, and a single mould allows the bullet caster to make lifetime supply of his own expanding hunting bullets. For more moderate expansion, one can simply adjust the throttle as desired. These cast HP's will expand down to about 1200 fps (depending on the alloy chosen, or course), allowing the hunter to tailor expansion by adjusting the velocity over a fairly wide range. The cast HP allows the hunter to make his own expanding hunting bullets, tailored to his (or her) exact wants and needs. Perhaps if Lyman receives enough letters, they might once again offer these moulds. After all, they are in business to make money. As a result, they only want to make moulds that they know they can sell. There are enough bullet casters out there to keep Lyman in business (obviously), and there are even more .30-30s out there than there are bullet casters. The question is: are there enough bullet casters out there who hunt with a .30 caliber firearms that want to hunt with the 31141 HP to make it a viable business venture for Lyman? I don't know. Neither does Lyman. If you're interested in hunting with a 31141 HP (or any other discontinued HP mould), then let Lyman know (they'll never know if you don't tell them).